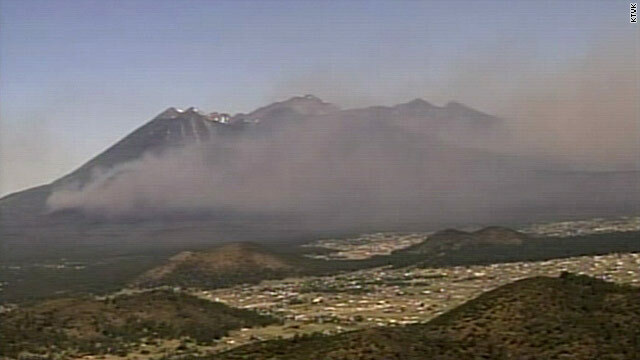 Smoke from a huge wildfire covers mountaintops near Flagstaff, Arizona, on Tuesday. Flagstaff, Arizona (CNN) -- Firefighters battling a two-day old wildfire near Flagstaff have made some progress, and it's hoped people who've been evacuated will be able to return to their homes Wednesday morning. That was the word from a bevy of officials who held a news conference Wednesday evening along with Gov. Jan Brewer. The governor, who spoke after taking an aerial tour of the fire and speaking by phone with President Barack Obama, called the 12,000-acre fire a "terrible situation," but she said she was "comforted by the competency of those fighting the fire and the heroes that are on the front lines." The governor said she'll be seeking grants through the Federal Emergency Management Agency to help pay for firefighting efforts, which have involved some 800 firefighters from Washington state, California, Montana, Colorado, Idaho and other western states. Fire Commander Dugger Hughes said the fire was 10 percent contained and noted that calm winds and cooler temperatures allowed firefighters to secure their firelines. He said officials will make an assessment in the morning whether people can start returning home. Residents were evacuated from at least 756 properties, including two residential neighborhoods, an animal shelter and the grounds of the Sunset Crater and Wupatki national monuments. Many people have been staying at a middle school in Flagstaff. Despite the progress, Hughes said it may take some two weeks to contain the blaze. So far, no buildings have burned. Fighting the fire is a challenge because it has burned over steep, rugged terrain at elevations between about 7,000 to 10,500 feet. Six air tankers have been fighting the fire, with helicopters were providing support to ground crews, according to the Coconino County website. CNN meteorologist Dave Hennen said winds should calm overnight but pick up again Wednesday, reaching 25 to 30 miles per hour. "Thursday looks even windier," he said. The county health department has issued a smoke advisory for parts of northern Arizona. It is urging that small children, the elderly and those with respiratory problems be especially careful. Emergency Operations Center spokeswoman Stephanie Smith said the wildfire, named the Schultz fire after a pass that's been fanning the winds, was started by an abandoned campfire. Officials are asking the public to come forward with any information about how the blaze started. As flames ripped quickly through Ponderosa pine, conifer, pinyon and juniper trees, they caught some locals off guard. The dangerous conditions spurred officials at the nearby Coconino, Kaibab and Prescott national forests to implement fire restrictions "to protect public health and safety and prevent human-caused wildfires." The restrictions will prohibit fires, campfires, charcoal, coal or wood stoves outside of developed campgrounds and limit smoking to within enclosed vehicles or buildings or in developed campgrounds. Pressurized liquid or gas stoves, lanterns, and heaters meeting safety specifications will continue to be allowed. The Schultz fire began late Sunday morning, temporarily shutting down part of U.S. Route 89. The road was reopened in both directions Tuesday, but officials note they may need to shut down the highway again, based on prevailing conditions. "The road could close at any time," Smith said. She said motorists should be prepared to take alternate routes. Smith also said she's been "incredibly impressed by the level of community support we've had in Flagstaff." Restaurants have been donating food for the firefighters, and people have giving donations to the United Way. A community meeting Monday night to brief residents on the fire attracted about 1,000 people, she said.